Becoming Native in a Foreign Land: Sport, Visual Culture, and Identity in Montreal, 1840-1885 (University of British Columbia Press, 2009). 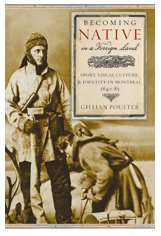 Gillian Poulter, “'Brave North Western Voyageurs': Snowshoeing in Montreal," in Home, Work and Play: Situating Canadian Social History, eds. James Opp & John C. Walsh, 3rd ed. (Don Mills, ON: Oxford, 2015). Gillian Poulter, “Embodying Nation: Indigenous Sports in Victorian Montreal,” Contesting Bodies and Nation in Canadian History, eds. Patrizia Gentile and Jane Nicholas (Toronto: University of Toronto Press, 2013): 69-96. Gillian Poulter, “What’s traditional about ‘the traditional funeral’? Funeral rituals and the evolution of the funeral industry in Nova Scotia,” Journal of the Canadian Historical Association 22, 1 (2011): 133-59.